You've got to consciously plan to succeed, or risk wasting your precious time, energy, resources and money. But how do you plan without guidance and support? You find a hiking coach or mentor, that's how. Or work on a hiking coach or mentor plan with Hiking For Her. If you're reading this, you're probably ready to get serious about problem solving, trip planning, or overcoming whatever is holding you back from your hiking dreams and aspirations. Because of its importance, I addressed the answer to this question at length. If you haven't already seen my answers, please go here. And if you have lingering questions about Hiking For Her's approach to the difference between the two after reading it, please contact me. The woman behind this website (that's me) is an old trail dog. We're talking nearly 50 years of hiking and backcountry camping experiences. In addition, this website has been offering trustworthy hiking tips for ten years. And I've gotten to the point where it's painful to receive emails from hikers who use the words "someday" and "if only". Because if I can do it, so can you! "All" it takes is a metamorphosis. You know, a change in the way you act, think, and believe. And that requires some work on your part. After a lot of thought, I've decided to offer an affordable, structured plan to move hikers from Point A to Point B virtually, so they can go ahead and do it for real on a hike. why of these is best for you? Simplicity is a wonderful thing. Let's flesh out your options a bit. Coaching: "I know I can achieve fast results with some guidance." Mentoring: "This is gonna take me awhile." Want to achieve a goal quickly? The first two coaching options are great for when you have a clearly defined problem or inter-related set of questions. need a quick one-to-one session to figure out how to choose an expensive piece of gear, for instance. want to bounce some ideas around and come up with your best solution to an upcoming hiking trip. are ready for a "jump start" strategy session on physical conditioning, hiking nutrition, gear lists, safety concerns, hiking for weight loss, elder hiking concerns, or any other trail related issue. A second option ($67) includes a pre-call questionnaire to help us both get crystal clear about what to focus on during the half hour call. After the call, you'll receive a written summary of what we talked about, with resources and a step-by-step action plan that you can implement right away. There are also times when you're up against a bigger problem, or wrestling with something fear related that is keeping you off the trail. First of all, you might need more time and attention to get at the heart of it. Support and encouragement as you take steps toward your goal(s) also would be appreciated. This friendly offer to help you over a rough spot on the trail (so to speak) is NOT a money grab on my part. Consider the moderate price points, consider my extensive hiking experience, and know that I am making this plan as affordable as possible while being respectful of my own time and energy (and trail time, to be honest). Metamorphosis is NOT a waste of your time, that's a fact. unique chance to focus on what's important to you. framework to create forward movement toward your hiking goal(s). The application is a way for both of us to decide if this is the right move for you at this time. If I can't help you, I'll tell you that. If possible, I'll share a few resources and suggestions to speed you on your way to a different solution. If I can help you, the details in your application will allow me to prepare for our phone call(s) and begin to pull together specific resources for you. I consider the chance to work with you a great honor, and will not enter into our coaching or mentoring agreement in haste. It also helps you clarify exactly what you are trying to achieve. For instance, wanting to take your first backpacking trip is definitely an achievable goal. But it's a big goal. It needs to be broken down into phases of planning, travel logistics, packing, food preparation, safety, the trip itself, and debriefing. Do you need help with all of those phases? It's a satisfying feeling to know what you know, and what you want and need to know, after going through the application questions. I take my responsibility as a coach and mentor extremely seriously. When I set aside time to work with you, I give it my all. That's why only a handful of hikers will join the Metamorphosis plan at any one time. As one hiker achieves a goal (hurrah!! ), another hiker on the wait list will be welcomed in. After we celebrate your hiking achievements, of course! 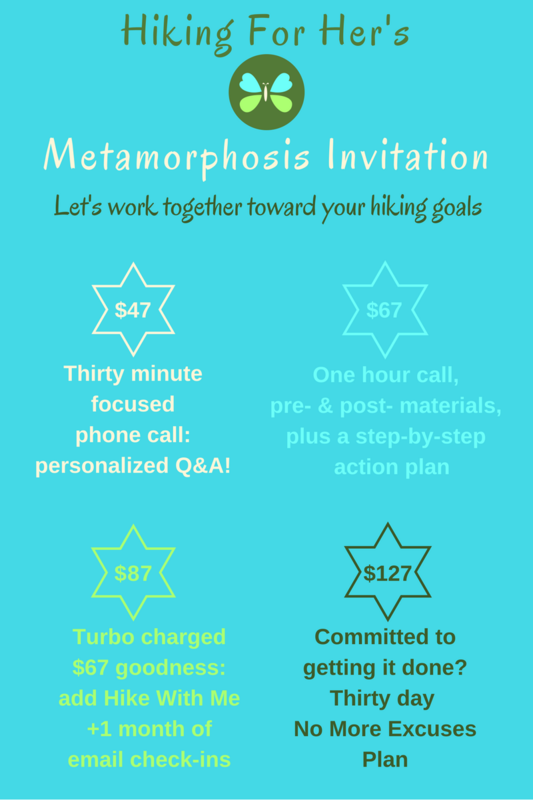 If a Metamorphosis hiking coach or mentor plan sounds right for you and you don't have any questions, maybe you'd like to fill out an application and get rolling toward your goals. This quick little form will make that happen. I understand that you will use my information to send me the Metamorphosis application, or to contact me. I'd love to work with you and celebrate your success!